Describe the basic structure of the atom, the substructure of all matter. Also during the 19th century, the kinetic theory of gases was developed. Kinetic theory is based on the existence of atoms and molecules in random thermal motion and provides a microscopic explanation of the gas laws, heat transfer, and thermodynamics (see Chapter 13 Introduction to Temperature, Kinetic Theory, and the Gas Laws and Chapter 15 Introduction to Laws of Thermodynamics). Kinetic theory works so well that it is another strong indication of the existence of atoms. But it is still indirect evidence—individual atoms and molecules had not been observed. There were heated debates about the validity of kinetic theory until direct evidence of atoms was obtained. The first truly direct evidence of atoms is credited to Robert Brown, a Scottish botanist. In 1827, he noticed that tiny pollen grains suspended in still water moved about in complex paths. This can be observed with a microscope for any small particles in a fluid. The motion is caused by the random thermal motions of fluid molecules colliding with particles in the fluid, and it is now called Brownian motion. (See Figure 1.) Statistical fluctuations in the numbers of molecules striking the sides of a visible particle cause it to move first this way, then that. Although the molecules cannot be directly observed, their effects on the particle can be. By examining Brownian motion, the size of molecules can be calculated. The smaller and more numerous they are, the smaller the fluctuations in the numbers striking different sides. Figure 1. The position of a pollen grain in water, measured every few seconds under a microscope, exhibits Brownian motion. 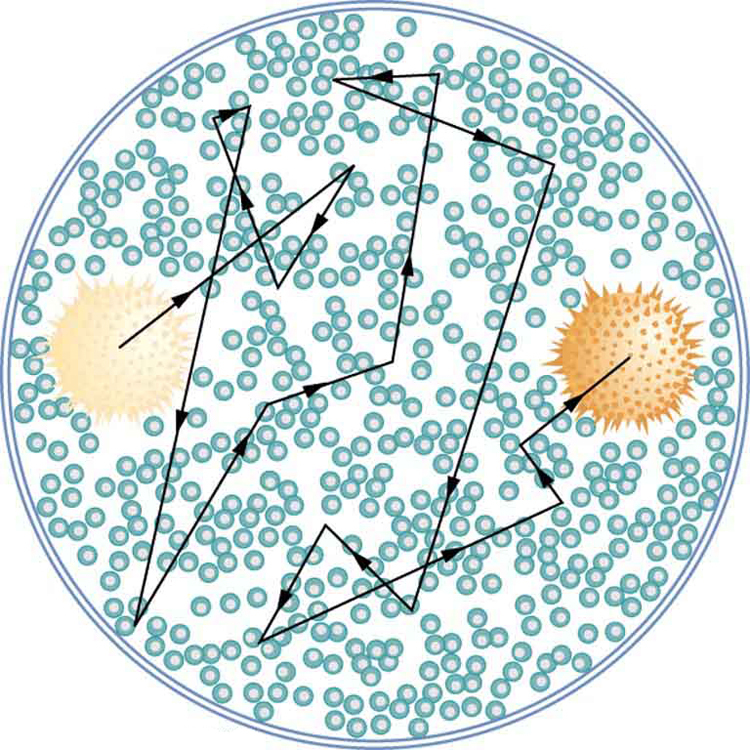 Brownian motion is due to fluctuations in the number of atoms and molecules colliding with a small mass, causing it to move about in complex paths. This is nearly direct evidence for the existence of atoms, providing a satisfactory alternative explanation cannot be found. It was Albert Einstein who, starting in his epochal year of 1905, published several papers that explained precisely how Brownian motion could be used to measure the size of atoms and molecules. (In 1905 Einstein created special relativity, proposed photons as quanta of EM radiation, and produced a theory of Brownian motion that allowed the size of atoms to be determined. All of this was done in his spare time, since he worked days as a patent examiner. Any one of these very basic works could have been the crowning achievement of an entire career—yet Einstein did even more in later years.) Their sizes were only approximately known to be , based on a comparison of latent heat of vaporization and surface tension made in about 1805 by Thomas Young of double-slit fame and the famous astronomer and mathematician Simon Laplace. A huge array of direct and indirect evidence for the existence of atoms now exists. For example, it has become possible to accelerate ions (much as electrons are accelerated in cathode-ray tubes) and to detect them individually as well as measure their masses (see Chapter 22 More Applications of Magnetism for a discussion of mass spectrometers). 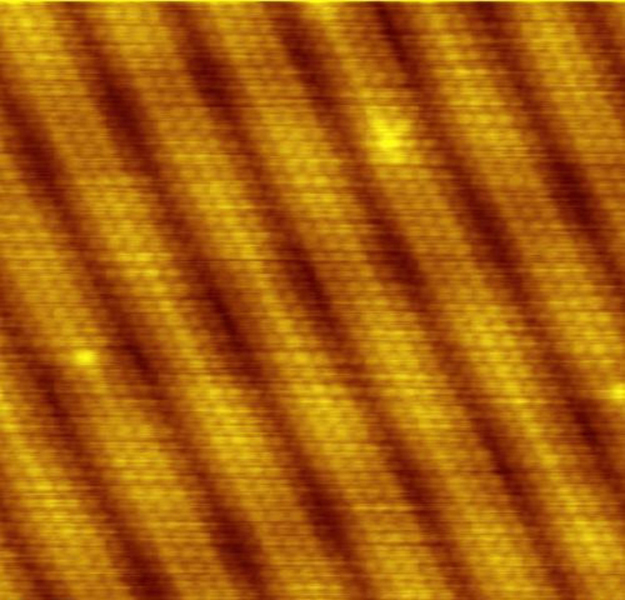 Other devices that observe individual atoms, such as the scanning tunneling electron microscope, will be discussed elsewhere. (See Figure 2.) All of our understanding of the properties of matter is based on and consistent with the atom. The atom’s substructures, such as electron shells and the nucleus, are both interesting and important. The nucleus in turn has a substructure, as do the particles of which it is composed. These topics, and the question of whether there is a smallest basic structure to matter, will be explored in later parts of the text. Analysis of Brownian motion gave accurate sizes for atoms ( on average) and a precise value for Avogadro’s number. 1: Name three different types of evidence for the existence of atoms. 2: Explain why patterns observed in the periodic table of the elements are evidence for the existence of atoms, and why Brownian motion is a more direct type of evidence for their existence. 3: If atoms exist, why can’t we see them with visible light? 2: (a) Calculate the mass of a proton using the charge-to-mass ratio given for it in this chapter and its known charge. (b) How does your result compare with the proton mass given in this chapter? 3: If someone wanted to build a scale model of the atom with a nucleus 1.00 m in diameter, how far away would the nearest electron need to be? 30.1 Discovery of the Atom by OpenStax is licensed under a Creative Commons Attribution 4.0 International License, except where otherwise noted.